Thanks to all the community members who came out tonight to the “Duke Energy Drop-In” on Riverbend coal ash. While I wish Duke had seen fit to attend our community meeting back in March rather than organize a PR event two months later, they did share the welcome news that they are committed to removing the coal ash from the shores of Mountain Island Lake. Woo hoo! Clearly the Dan River spill, public pressure and threat of legislative action have Duke Energy scrambling to get their coal ash act together. However, they still seem painfully incapable of that oh-so-essential first step to recovery: admitting you have a problem. They are still hell-bent on trying to convince us that coal ash isn’t really bad for us. In light of Duke’s mis-information campaign, or as someone highly educated on the topic referred to it once, “weaselly wording,” I thought I’d share a little info on arsenic (info that is actually factual and straightforward). You see, there’s organic arsenic (naturally occurring) and inorganic arsenic – the kind found in coal ash. Inorganic arsenic is a byproduct of burning coal and is a known carcinogen. That’s why the EPA regulates the amount allowed in drinking water. Naturally occurring organic arsenic is not linked to cancer. All arsenic is not created equal. One will give you cancer; the other won’t. Yes, Mr. Duke Energy, there is naturally occurring arsenic. 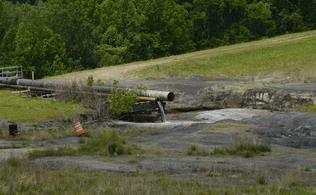 It’s just not what’s lurking in those coal ash ponds. Nice try with the weaselly wording. But we aren’t stupid.